About two hours west of Sydney, the Blue Mountains is a popular day trip destination for families, historians and backpackers because it offers rich history and wonderful sights. This place used to represent one of the biggest challenges to early explorers, but is now one of the greatest natural attractions in Australia. Undoubtedly, the star of the Blue Mountains is the picturesque town of Katoomba and its surrounds, a favourite weekend getaway for Sydneysiders. When exploring the Blue Mountains, it is highly recommended to book a car hire in Sydney at VroomVroomVroom. You are assured of getting a reliable car at an affordable price for your trip. To make your adventure more fun, we have listed down some of the places you can visit from Sydney to the Blue Mountains. Katoomba is the most visited of all towns in the Blue Mountains, not only for its picturesque location and countless tourist attractions but for its charming streets lined with historical buildings, cafes, antique shops and boutique hotels, not bad for a former mining town. Before you start looking for a park, take a quick trip along Cliff Drive for a glimpse into the magnificent, colourful Katoomba landscape, with its golden cliffs and rocky outcrops, thick green forests and distant blue hues. Directions: From Sydney, drive your rental car via Great Western Highway to reach Katoomba which is approximately less than two hours away. You can also take M4 or M5 before heading off to the highway. 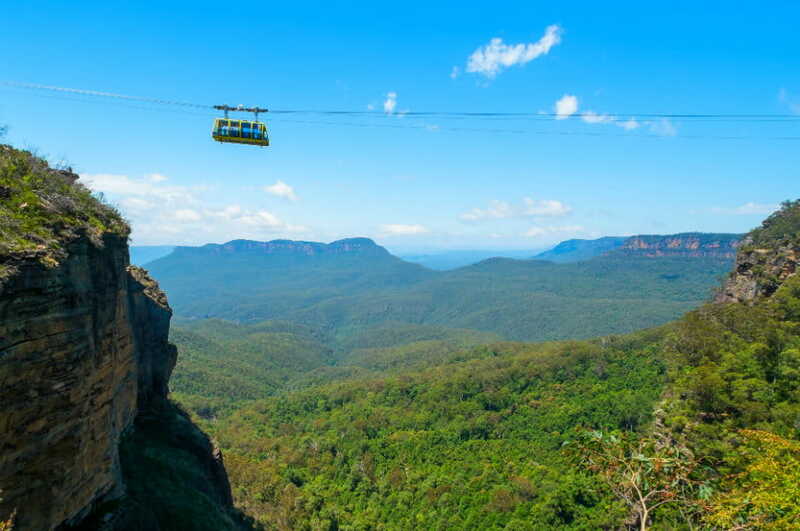 Enjoy panoramic views of the Blue Mountains, Katooomba Falls, Jamison Valley and the Three Sisters from the Scenic Cableway and Scenic Skyway. The Scenic Railwayis the steepest railway on earth and the journey takes you through breathtaking scenery, ancient rainforest, Orphan Rock, a kid-thrilling tunnel and to the ferny cliff face. Explore almost 3 kilometres of Scenic Walkway with plenty of interesting facts and attractions along the way. The soft sandstone that makes up much of the Blue Mountains makes for terrible farming but breathtaking natural rock formations. Through erosion, these three monolithic formations jut out over the valley and make for a striking view. The natural light and the seasons dramatically change the appearance of the Three Sisters and the floodlighting in the evening is well worth a viewing. The unusual name is believed to come from an ancient Romeo and Juliet style fable in Indigenous folk law. The story goes that three sisters fell into forbidden love with three brothers from a neighbouring tribe and were turned to stone by an Elder for their own protection. The Elder was then killed so the girls were destined to stand at Echo point, frozen in stone for eternity. 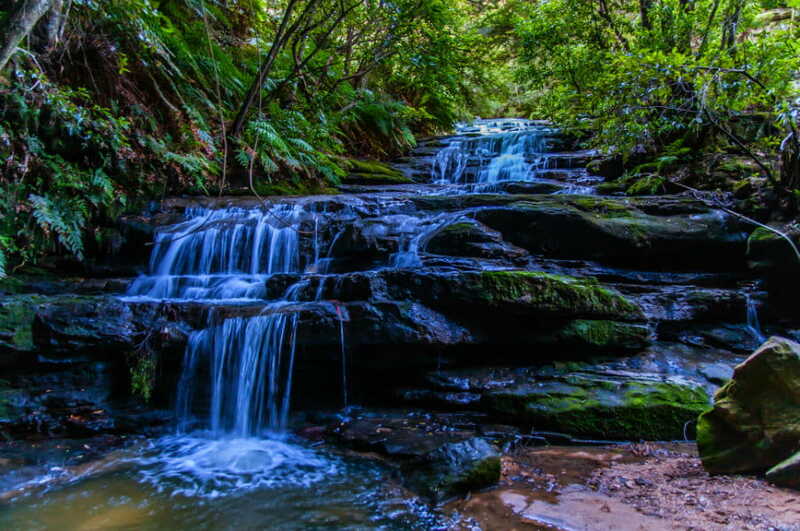 Head to Prince Henry Cliff walk, which connects Echo Point to Leura Cascades, to see more scenic lookouts along the cliff edge. Learn more about the traditional Aboriginal culture and watch authentic dances from the Blue Mountains at the Waradah Aboriginal Centre. Enjoy great food and amazing views of the cliffs from the huge terrace of the Lookout Restaurant. 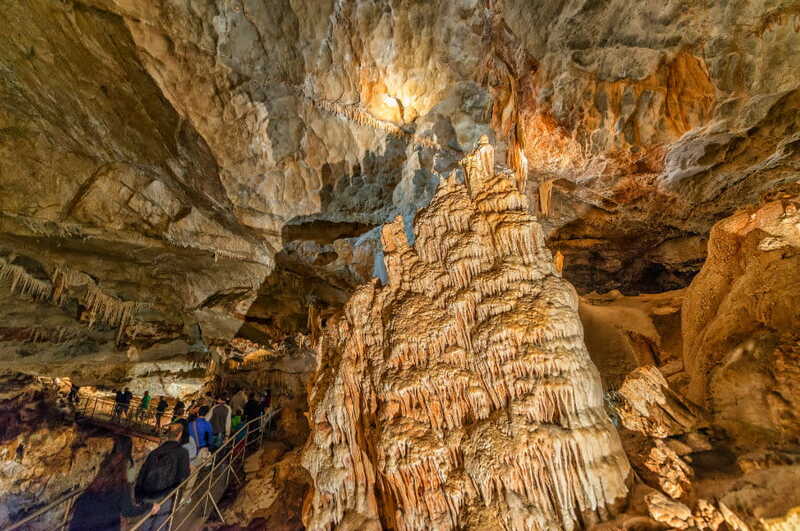 Situated on the west of the Blue Mountains, these impressive limestone caves can be found within the Jenolan Karst Conservation Reserve. It can be easily accessed from Sydney, Oberon and Katoomba. The word Jenolan was derived from the indigenous word Genowlan which means "high place" probably because of its location. The Jenolan Caves is one of the most outstanding cave systems in Australia and it is known for its spectacular limestone crystal formations and underground rivers. Directions: Pass by Katoomba going to Hartley Historic Village then turn left at the Jenolan Caves turnoff; and the road will take you through the tiny village of Hampton before reaching the Jenolan Caves. If you are a thrill-seeker or just want to do something extraordinary, experience the excitement of Adventure Caving. Are you scared of ghosts? Well this is your chance to overcome your fears by joining the Legends, Mysteries and Ghosts tour. 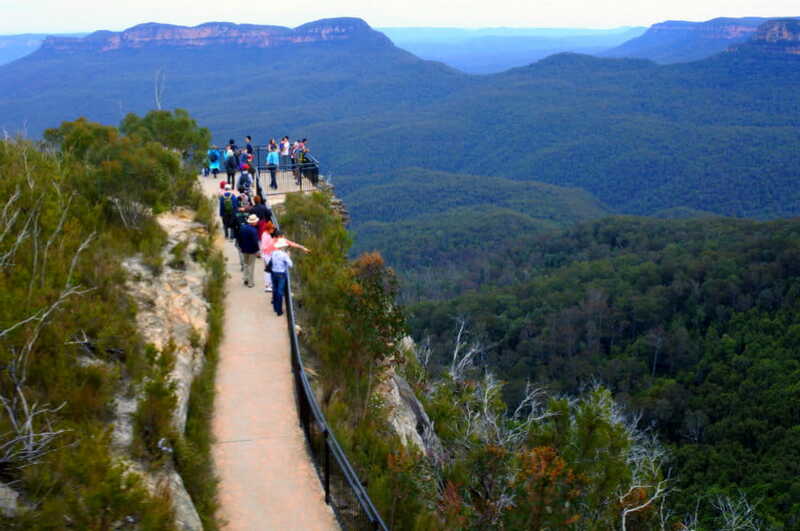 Apart from the amazing caves, take time to go bushwalking at the Jenolan River Walk. Also known as the "jewel in the crown" of the Blue Mountains, Leura Village has become a popular tourist destination of road trippers. It is home to a number of museums, historical sites and spectacular photo opportunities from Sublime Point Road and access to Katoomba Falls. A drive through the mountains to many of the nearby towns including Leura is a very pleasant way to spend a day and you might even spot the luscious cherry trees in full bloom in spring. Directions: It only takes around 9 minutes to reach Leura Village coming from the Blue Mountains. Head north on Echo Point Road toward Foster Road then continue to Lurline Street. Experience the charm of Europe without leaving Australia by heading to the Everglades House & Gardens, which is famous for its European-style terraces and tranquil Reflection Pool. See the largest private collection of teapots in the world at Bygone Beautys. Apart from the Teapot Museum, you can also find antiques, jewellery and interesting gifts in this place. There are lots of great places in Leura to have a picnic including the Leura Falls Picnic Area and Gordon Falls reserve.